The Challenge: Can Printed Interconnects Match the RF Performance of Bond Wires for Microwave Interconnects? The shortcomings of round bond wires for RF applications are well-known to RF designers. From a performance standpoint, the high and inconsistent loop heights of bond wires can be a detriment to low-loss coupling, especially with increasing circuit frequencies. Likewise, from a reliability standpoint, bond wires suffer from a number of well-known failure mechanisms such as flexing fatigue, die cracking and pad delamination. To make matters worse, these bonding problems only intensify when mated to the delicate bonding pads of substrates such as GaAs. 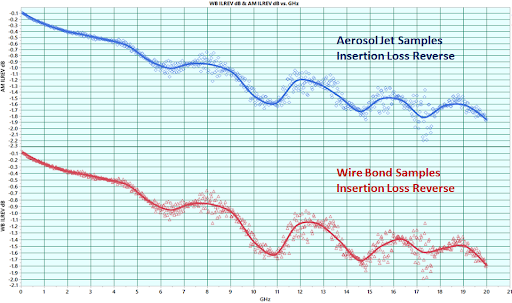 Switching from round bond wires to flat bond ribbons has proved to be a step in the right direction, as they produce interconnects with lower bond heel fatigue failures, lower insertion losses and lower, more consistent loop heights. However, bond ribbons still have issues: long conductor paths, high package profiles and the stressing and deformation of fragile components from the ultrasonic bonding process. Clearly, the next step in the progression of technology would be to create a bond ribbon with zero loop height, zero flex fatigue and zero mechanical stress on fragile components. Printing the bond ribbon directly onto the PCB and RF component pads would potentially satisfy these longstanding challenges for RF designers. The engineers at ACI Technologies, in cooperation with Optomec Inc, gave this a try using Aerosol Jet® technology and are reporting some very encouraging results which are to be published in more detail shortly. 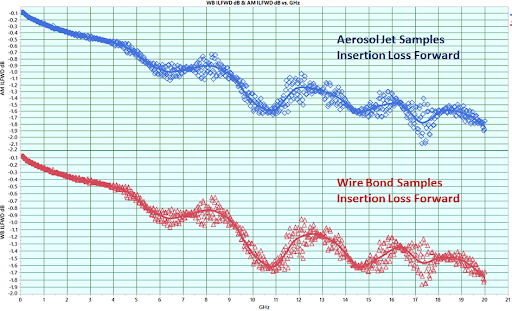 For this evaluation, two-port test assemblies were produced using both traditional gold wire bonds and Aerosol Jet printed interconnects. The test assemblies comprise a ceramic/PTFE circuit board with microstrip traces as the I/O to and from a Triquint TGL2217 power limiter. The power limiter is a GaAs part with gold bonding pads and a specified insertion of loss of <0.7 dB from 0 to 20 GHz. 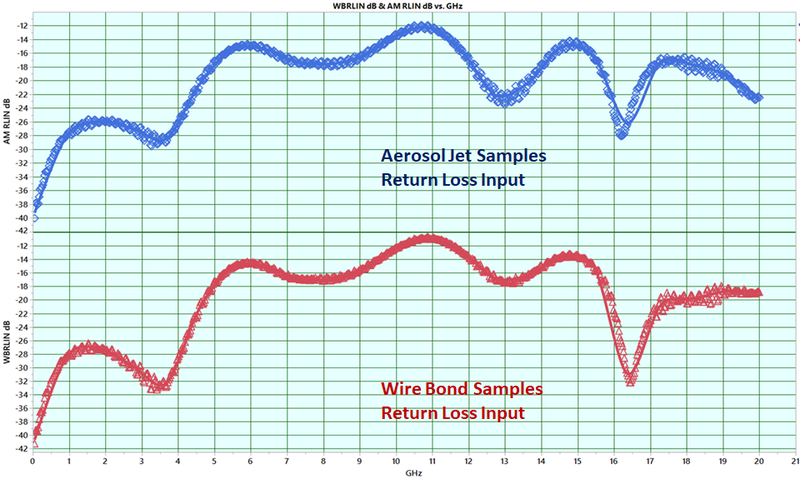 These samples were compared to interconnects produced with the Aerosol Jet® process. The first step in this process is to create a suitable printing surface for the conductive ink. In this case, epoxy was dispensed around the chip to create a smooth height transition from board to IC. The epoxy was then UV cured in place and over-coated with acrylic. The interconnects were then printed from the gold pad on the board, over the epoxy fillet and onto the gold pad of the IC. In this case the commercially-available ink, comprised of silver nanoparticles, was produced by PV Nanocell. A network analyzer was used to compare the RF performance of the printed interconnects to that of samples using traditional gold wire bonds. S11, S12, S22 and S21 measurements were made from 0 to 20 GHz at 25 MHz steps. The results showed very close correlation to the gold wire bonds. Printing RF interconnects from board to component with Aerosol Jet® technology is a promising alternative to using wire bonds which are known to suffer from a number of potential failure mechanisms and have limitations with regard to packaging options. 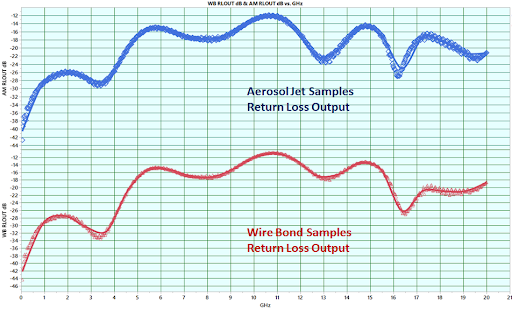 This experiment showed that Aerosol Jet® printed interconnects display similar RF transmission performance to wire bonds for frequencies in the microwave range. As industry moves to higher frequency RF designs, we should see an even greater interest in replacing wire bonds with directly-printed interconnects to improve RF coupling performance. As product manager for Optomec's Aerosol Jet family of 3D printed electronics solutions, Bryan guides the product development efforts and customer implementations, leveraging his background in mechanical engineering and experience working with sensors, materials research and additive manufacturing at GE Power Service.